Last week I co-authored an article over on Medium about why the UX of learning UX is broken. The response has been beyond overwhelming. So far the article has been recommended over 1,000 times and has over 75 comments. Thank you to everyone who already read it or left a comment! It’s been tough to keep up with all the feedback. In the article, my co-author and I build the case that you cannot become a User Experience designer in a few weeks or months. Unfortunately, many UX education courses are marketed as such. Sure, you might be able to learn some basics. But, I fundamentally disagree that you could have a portfolio and be interview ready in a week. If there’s one thing you take away from the article, let it be this: The job of a designer is never done, and the education of a designer is never over. A lot of people ask me what they can do to keep learning. To be honest, you have to develop a really curious mind – a mind that is always looking for problems to solve, and then sometimes taking the time to solve them. Here is a fantastic example. One night this week I was really busy and realized I hadn’t eaten dinner yet, and didn’t have groceries on hand to make anything decent. 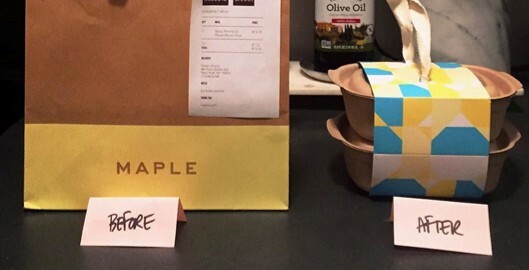 So I decided to order from the NYC delivery service, Maple. When the order arrived, it came in a cute brown paper bag with handles, and then inside were the two containers of food, held together by a piece of cardboard that was wrapped around the two boxes. I immediately thought, “yuck, I hate that everything came in that paper bag, what a waste”. And then I immediately got out a pair of scissors, took off one of the handles from the bag, and put it on the paper that was holding the boxes together. Voila. With some tweaking, it could work – and probably save a lot of money in packaging. Not to mention save a paper bag from going to into a recycle bin. Next time you spot a problem, take a few minutes to think about how you would solve it. It took me a total of maybe 2 minutes to make my little prototype. To have a mind that’s always creating, you have to train it. And this quick problem & solve is exactly the type of stuff I do all the time to constantly challenge myself to never stop learning. Feel free to tweet me with photos of problems you solve as you go about your day! I’d love to see you flexing your creative minds.